Software developer, Mark ‘Run Geordie Run’ Allison, has set himself the phenomenal charity challenge of running 20,000 miles around the world. He has already run down the UK and across the USA and Australia, and he leaves his native North East today (25 April) ahead of the next stage of the run – 3,400 punishing miles across Europe starting on 1 May. Mark is raising funds for two charities which are very close to his heart, The Children’s Foundation and the Sir Bobby Robson Foundation. He will need to draw on his motivation for running as he tackles a route which takes him through 14 countries and includes the Pyrenees and Alps mountain ranges, 15 Tour de France climbs and one Giro d’Italia climb. Mark says: “This run is a big step up for me in terms of distance and especially elevation. “It’s 300 miles longer than my run across America and I’ll be doing it in the same number of days. “The logistics of running through so many different countries brings with it a whole new set of challenges, too. Europe’s certainly been a lot more difficult to plan for than previous runs. “I’m looking forward to actually getting started and putting all the preparation into effect. But knowing there are 9,000ft climbs like the Stelvio Pass and 15 Tour de France climbs ahead of me is daunting. “I’m very lucky to have a great Support Team around me, all volunteers and all paying their own way, but in the end I know this is down to me putting one foot in front of the other no matter how hard it becomes. Mark begins his run to raise funds for The Children’s Foundation and Sir Bobby Robson Foundation on 1 May in Lisbon, Portugal. All being well, he will finish in Istanbul, Turkey, 100 days later. He set off from Tynemouth today (25 April) in the motor home that will be home for the duration of the challenge and is heading south to Portsmouth where he will catch a ferry (26 April) to Santander, Spain. He chose to leave from Tynemouth because he will return home via the river and a ferry into Port of Tyne in August. Mark’s headline sponsor is Team Valley-based office technology and services company, SOS Group Ltd. He is also receiving support from Fresh Freight Group, Chapman Ventilation, Cherry Active, D-Line Cable Management, Brooks Running Shoes, Virgin Money and Sport Newcastle. These generous commercial sponsors are enabling Mark to raise additional charity funds through t-shirt sales and events as well as ensuring he is kitted out with the specialist equipment and footwear he will need. Like Mark, the Run Geordie Run Support Team consists entirely of unpaid volunteers who are taking time off work to join the challenge. Paying for their own travel expenses, they will accompany and support Mark each day, helping him cope with the physical and mental pressures and providing vital encouragement as the miles take their toll. Libby Nolan, Fundraising Manager for The Children’s Foundation, says: “We are so proud to call Mark our Ambassador and as he sets off on another of his challenges we wish him and his support team all the luck in the world. “We will be cheering him on all of the way and are so grateful to how much everyone has put into making this run successful. Projects such as our Clown Doctors at the Great North Children’s Hospital will benefit from the funds raised and help children and young people from across the North East and North Cumbria. 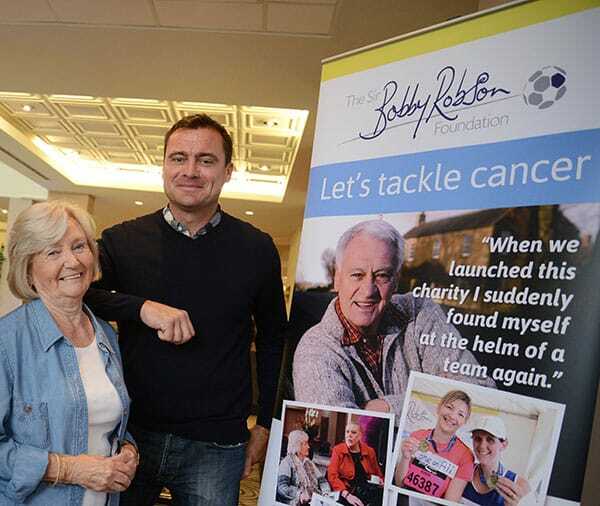 Sir Bobby Robson’s son, Andrew Robson, says: “The amount of preparation that’s gone into organising this run is absolutely incredible. And of course Mark’s also been very busy fundraising for the two charities, too. “I’m told this run is even further than Mark’s run across the USA and it has a lot of very significant climbs. Mark’s challenge began, although he didn’t know it at that time, with his John O’Groats to Land’s End 874 mile run in 2007. He has also already ‘ticked off’ the USA (2011) and Australia (2013), 3,100 miles and 2,384 miles respectively, but still has approximately 13,642 miles to go. The European leg brings its own set of challenges, not least running through 14 different countries. Mark will begin on 1 May in Lisbon, Portugal, and will finish 100 days and 3,400 miles later in Istanbul, Turkey, on 8 August. The run is 300 miles longer than the USA and will be completed in the same number of days. The chosen route passes through Portugal, Spain, Andorra, France, Italy, Slovenia, Switzerland, Germany, Austria, Croatia, Serbia, Bulgaria, Greece and Turkey. It includes both the Pyrenees and the Alps and will take in many huge climbs including the Stelvio Pass (9,045 feet) in the Italian Alps. It is a huge step up from his previous runs in terms of distance and elevation and, as well as mental, physical and logistical difficulties, there will be language and cultural barriers to overcome. After Europe, Mark will tackle the Turkey, Georgia, Russia and Kazakhstan leg (2018), then China (2020), Japan (2021) and New Zealand (2022) – all timings are approximate and dependent on Mark’s circumstances. For more information about Run Geordie Run Around the World please visit www.rungeordierun.com and follow Mark on Twitter @RunGeordieRun. If you would like to donate to the two charities, The Children’s Foundation and the Sir Bobby Robson Foundation, please visit www.virginmoneygiving.com/rungeordierun.